Smartphones are all about styles nowadays so why just keep it limited to the phone. Imagine yourself in a fashionable Trench coat that can both charge your phone and give you a 4g connection. 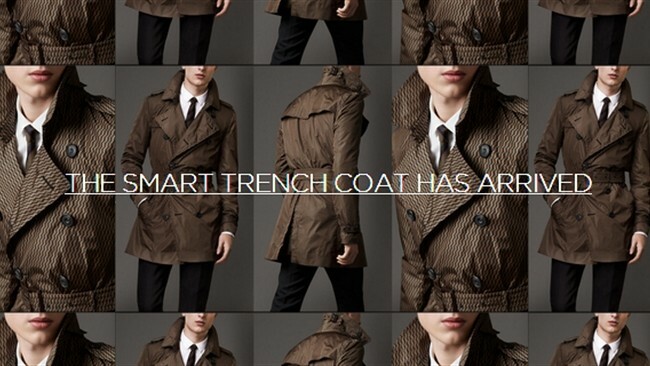 The Trench coat is called Motiif “M” smart trench coat. As it’s already winters and everyone wants to be warm and stylish as well so why not go for something techy and stylish that would keep you warm as well. For those of you, who are worried about the wires being exposed, don’t bother about it the Motif Trench coat is designed in such a way to hide all the wires and make u look like a professional man. Aside from style let’s come to the actual hardware that is hidden inside the Trench coat. The charger included in the coat works wirelessly and is located in the breast pocket. The phone that you can use with this coat is limited for now like Apple iPhone 4, Apple iPhone 4s, Apple iPhone 5 and Apple iPhone 5s according to Rafael Balbi who is the founder of Motiif’s. He also said that smartphones like Samsung Galaxy S III and the Samsung Galaxy S4 are also supported but that’s about it. The Trench coat is still new but Rafael Balbi promises the support for more handsets as well. The best thing about the coat is that when it runs out of charge you can hang it on its hanger that also supports wireless charging pretty sweet right? They will be releasing special cases for every phone to charge them wirelessly. The 4G connection is provided by Karma’s network though; the owners of the coat will get 1GB of free data for 3 months after that they have to pay $14 for each 1 GB that they consume. If you’re worried about the connectivity issue, Karma uses a Sprint 4G connection which reaches 80 U.S. cities and 135 million people. The bandwidth that the connection supports is 3 to 6MB down and 1.5 MB up. The coat is set to release this February but the company wants to test this coat and they want volunteers with the help of which they will test the coat. You will have to then wear the coat for 2 weeks and brief them with the experience you had with it.